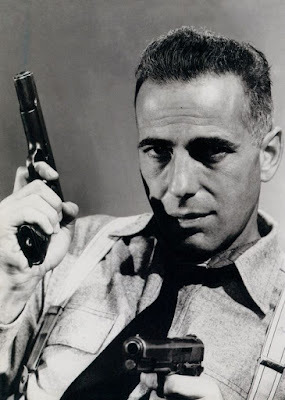 Today, I'm reviewing the gangster film, High Sierra (1941), starring Humphrey Bogart. 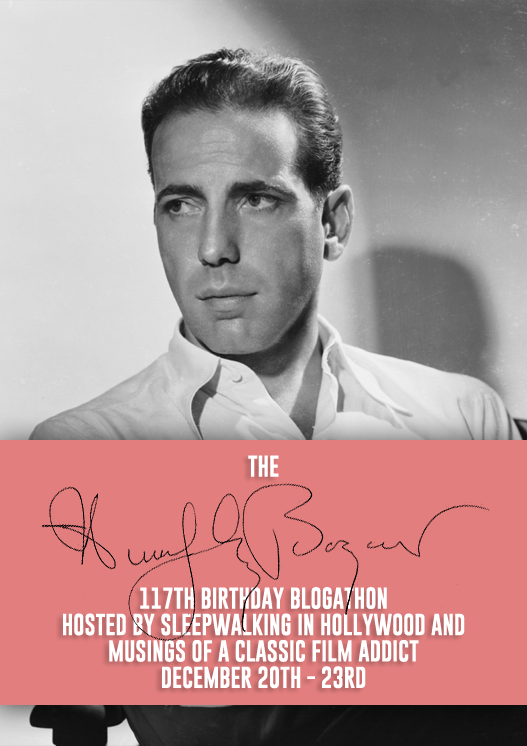 This article is part of The Humphrey Bogart 117th Birthday Blogathon hosted by Sleepwalking in Hollywood and Musings of a Classic Film Addict. Humphrey Bogart was a Christmas-Day baby, and a great way to celebrate his birthday is to watch the gangster film High Sierra (1941), which placed the actor among the first ranks of old Hollywood stars. High Sierra tells the story of Roy "Mad Dog" Earle (Bogart) a recently pardoned bank robber who is hoping to pull off one last heist at a California resort before retiring to travel the world and get married. Roy is sweet on the disabled granddaughter (Joan Leslie) of an acquaintance (Henry Travers) -- he pays for an operation to fix her club foot with his ill-gotten gains -- but he soon becomes entangled with the troubled Marie (Ida Lupino), a dance-hall girl who has taken up with his two accomplices (Arthur Kennedy and Alan Curtis). 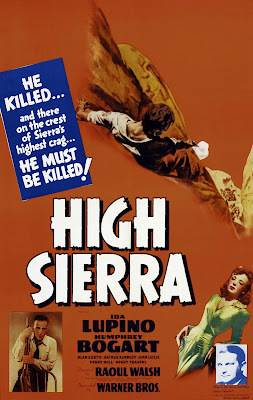 High Sierra was based on a novel by W.R. Burnett that was turned into a taut screenplay by ace screenwriter and soon to be first-time director John Huston. Warner Bros. decided to capitalize on Ida Lupino's buzzworthy performance in They Drive by Night (1940) by re-teaming the actress with leading man George Raft and director Raoul Walsh for another fast-paced crime movie. However, Raft, who had grown tired of being typecast as a gangster, turned the part of Roy down. The studio then turned to Paul Muni, and, according to some sources, James Cagney and Edward G. Robinson, who all turned down High Sierra for much the same reasons as Raft. Finally, Bogart, who was a lowly contract player at Warner's, got the part simply because the studio couldn't find anyone else to do the job (in fact, Bogart became a legend by appearing in parts that Raft turned down: The actor also passed on The Maltese Falcon and Casablanca). 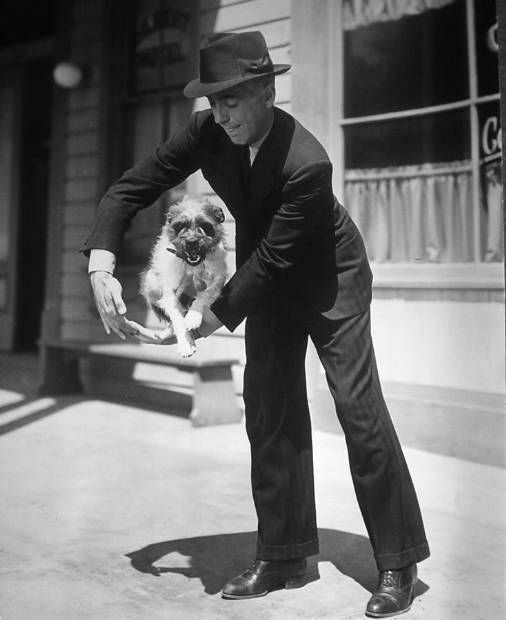 The result was a box-office and critical success that established Bogart as a major new star in Hollywood. 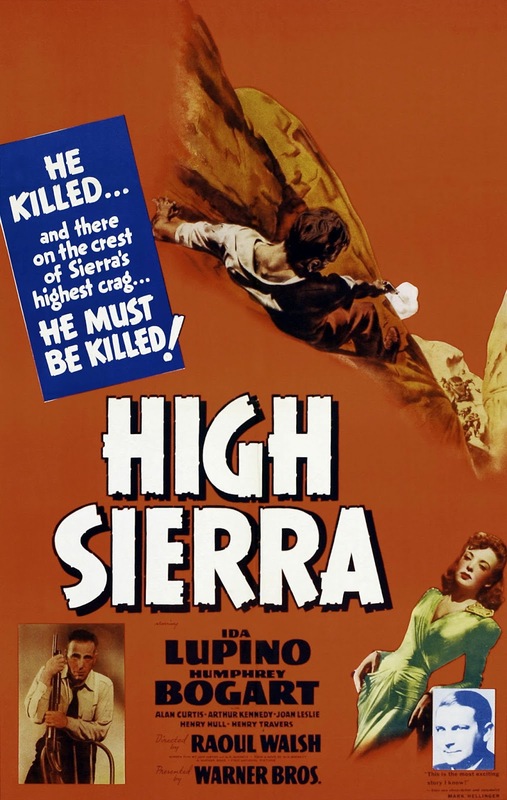 Viewed today, High Sierra is one of the best films of the early 1940s. The movie has a lot going for it, including a cute canine co-star and an excellent supporting cast -- the always exceptional Arthur Kennedy is a welcome presence and Joan Leslie, who transforms from a meek innocent into a ungrateful party girl, gives the the performance of her career. Walsh's fast-paced directing style is well-suited for this story, especially during the nail-biting final chase scene, and his insistence on outdoor shooting is very effective in the movie's tragic finale, which was filmed on location at Mount Whitney in the Sierra Nevadas. However, High Sierra's success mostly rests on the shoulders of Lupino and Bogart, who play two lonely outsiders who are thrown together by fate. Lupino manages to be both tough-as-nails and radiant and her moving work in the film's final scene rivals anything put on screen by more well-known actresses. That being said, it is Bogart who is at the center of the film, and it is his vulnerable performance that makes High Sierra worth watching. Humphrey Bogart plays with his canine co-star, Zero, on the set of High Sierra (1941). Although Roy has the fearsome nickname of Mad Dog Earle, in reality he is quite sensitive and vulnerable. He can certainly brandish a gun (Roy kills several people during the course of the movie), but he also has a soft spot for dogs, and he even likes to indulge in star-gazing on clear evenings (it's hard to imagine Cagney or Robinson stopping to contemplate the heavens in between killing sprees). Roy is certainly a thief and thug, but he abides by a certain code of honor that makes him seem old-fashioned. He freely acknowledges this, calling himself a "14-karat sap" for bringing along a dog and a woman during his crime spree, and, in a sweet gesture, he gives Marie an engagement ring out of some stolen loot. In fact, it is Roy's emotions that are his downfall in High Sierra's tragic finale. He has been holed up in a mountain pass for days, but his love for Marie and their little dog is too strong, which leads to a bitter fate. High Sierra is available on DVD and video on demand.